Care at the end of life has developed into a sophisticated specialty, historically modeled around the needs of incurable cancer in terms of complex, rapidly developing symptomatology and psychopathology in a predictable time frame. It is ill-equipped to manage people dying of other conditions, and the aging of the population will see the rise of multimorbidity, frailty, dementia, and organ failure as predominant causes of disability and death. The existing specialized, hospital-focused, and subspecialized health system that currently manages very ill people will not be able to cope with the complexity, multimorbidity, and unpredictability that characterize the future. Generalists, particularly community-based services, will inevitably have a very significant role to play. This chapter examines the role of primary care, specifically general practice, in managing end-of-life care. 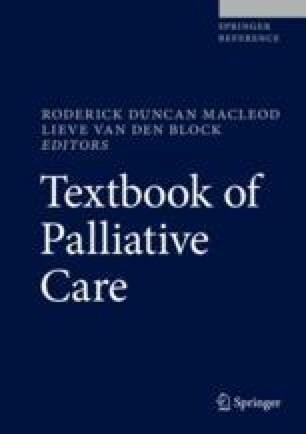 It describes the similarities between the aims and objectives of general practice and palliative care, the scope of generalist end-of-life care, the past performance of general practice at the end of life, and models of care that can enhance both GP performance and integration between specialists and generalists. It concludes with initiatives that will facilitate national policy development to promote effective end-of-life care. Mitchell G, Senior H, Johnson C, Fallon-Ferguson J, Williams B, Monterosso L, Rhee J, McVey P, Grant M, Aubin M, Nwachukwu H, Yates P. Systematic review of general practice end-of-life symptom control. BMJ Support Palliat Care. 2018b. https://doi.org/10.1136/bmjspcare-2017-001374. World Health Organization. Definition of Palliative Care. WHO Geneva, 2004. www.who.int/cancer/palliative/definition/en/. Accessed 28/6/18. World Health Organization. Strengthening of palliative care as a component of integrated treatment throughout the life course. 2014. Contract No. : http://apps.who.int/gb/ebwha/pdf_files/WHA67/A67_R19-en.pdf.